What is the Baylink Shuttle? Additional public open space including a Foreshore Promenade and park facilities with BBQ and picnic areas, amphitheatre and play equipment. The Baylink Shuttle is currently operating on a loop service between Wentworth Point and Rhodes, taking in stops within Wentworth Point, the ferry wharf and Rhodes station. See route at right. 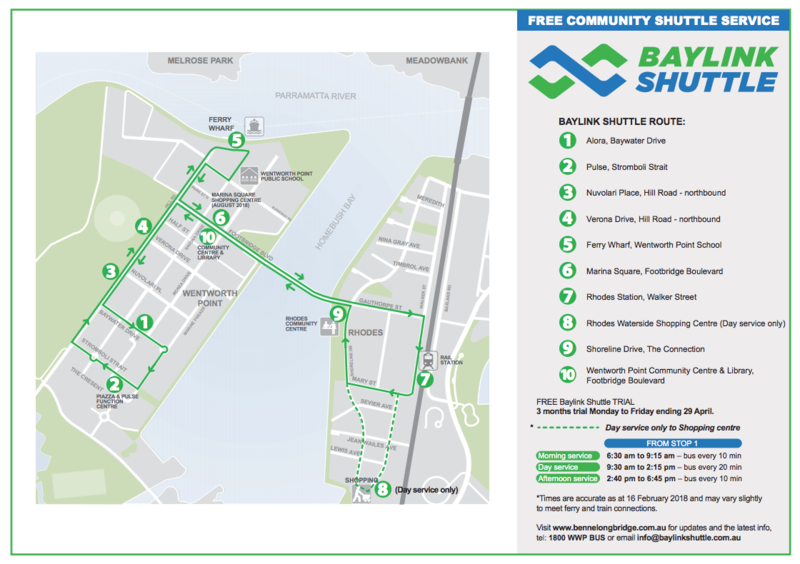 Billbergia has established a trial of the Baylink Shuttle, which commenced late January and will operate for 3 months, to demonstrate the community value of the service. In the first few weeks of operation, over 35,000 passenger trips took place and the buses are often full. For more information, refer to the FAQs provided by Billbergia. City of Parramatta Council has not approved the VPA and the resolution of the Council meeting held on 26 February 2018 seems to indicate that Council is not interested in the Baylink Shuttle being included in the VPA as they state that transport is a State Government matter. They are seeking to refer to the State Government and Minister for Transport to provide funding. See minutes from the meeting at right. Wentworth Point residents (and others) have overwhelmingly responded favourably to the service, with significant positive feedback to the developer and on social media. If the community wants the service to continue, we need to convince Council that they should include it and progress the VPA. Note that there is additional residential uplift as a "cost" of the VPA. Wentworth Point Community Central has organised a public meeting with the Lord Mayor, Councillors and Council staff for Saturday 14 April at 11am in the Pulse function room. All residents are welcome to attend to hear what Council has to say and to provide feedback. Email Council and Councillors asking them to progress the VPA or come out to Wentworth Point and address a public meeting on Saturday 14 April 2018 explaining why they won't do so. To make it easy for you, we have provided some sample wordings for you to use below. Just pick the one that you prefer. Click here to generate an email addressed to the correct recipients. Copy one (or more) of the suggested wordings from below and paste into the email. Add your name and address at the bottom of the email. Make sure that you come along to the community meeting on Saturday 14 April 2018 to have your voice heard. The trial of the Baylink Shuttle at Wentworth Point has demonstrated the community benefit of this service. Many residents are making regular use of this service. I am writing to ask you to progress the Voluntary Planning Agreement with Billbergia so that this service (and the other services proposed) can be confirmed and provided to the community on an ongoing basis. I understand that the Voluntary Planning Agreement involves a residential uplift. The State Government continues to fail to provide adequate public transport and other infrastructure to our area. Indeed the Bennelong Bridge was an initiative of Billbergia, via a prior VPA, and this has finally provide reasonable access to Rhodes train station. However, the State Government buses fall woefully short of an adequate service. The timetable is appalling - in terms of frequency and connections - and the service itself is unreliable. The Baylink Shuttle provides a solution that has been embraced by the community and I write to ask you to ensure it continues. Wentworth Point Community Central has organised a public meeting re this on Saturday 14 April at 11am in the Pulse Function Room. I look forward to hearing from you on that day. As a property owner in Wentworth Point I want to voice my support for the free Bay Link shuttle bus service to Rhodes train station. The service makes it easier for people to access shopping and the city’s train network and helps to reduce the number of cars in the area. It also makes it easier for people with small children to get around, as well as for visitors to Wentworth Point. Reliable transport and community services are essential if we are to encourage more families to move to the area and I urge the Council to support this service as as a long-term initiative. Many residents in Wentworth Point are wondering what will happen at the end of the 3-month trial of the Baylink bus service. The buses are extremely popular. They have been very well received by the community and are often full. I understand that 2 more buses have been offered by Billbergia as part of the last stage of their water front development. We sincerely want this bus service continues and we would also like to see new services added on weekends and week nights. We hope council supports this service in the long term. I am writing to confirm my strong support for the new BayLink shuttle bus service at Wentworth Point. The service has been running since the end of January and has had more than 35,000 passengers in the first 3 weeks. This is not hard to believe as the buses are always full by the time they reach Footbridge Boulevard from around 7:30am each morning. Billbergia has said the will pay for 2 extra buses, as part of their final development next to the Bennelong Bridge. The Baylink buses make it very easy for people to connect to Rhodes station for work and are an important addition to the NSW government buses, which are often late. With the amount of development that has already occurred or is planned in Wentworth Point, public transport is important to residents. Many people moved to the area expecting services like the school and library and I am glad to see that they are being delivered. The addition of the bus service will make Wentworth Point a better place to live for everybody. My neighbours and I have been discussing the new local Baylink bus service that commenced as a trial in January this year. We have been told that a decision about whether the service will continue as a fill time bus service has been passed onto Parramatta Council’s planning department. We strongly urge Council to support the services. I would also like to see the current timetable extended to weekends and nights. And make a suggestion that the small bus currently running is replaced with a larger bus to carry more people. I live in Wentworth Point and have been using the free Bay Link buses since they were introduced at the end of January. They are very reliable, although are often full. I attended a community info day in the plaza of the new library a couple of weeks ago and was told that the bus service is a trial by the developer Billbergia to encourage people to use public transport and has been offered as part of the last stage of water front development. Many people don’t have an issue with development, if it includes services such as the Bennelong bridge, school, Library (that is still to open) and better public transport. The new bus service provides direct access between Rhodes and Wentworth Point and helps solve some of the traffic problems in our suburb. I strongly support this services continuing, with extra weekend and evening services. I am following up about the long-term status of the Baylink bus service that is proposed by Billbergia for the next 20 years in return for additional development at Wentworth Point. Some of my neighbours attended a community info day in February and were informed that a final decision on the bus service, as well as a childcare centre and large park is up to Parramatta Council. 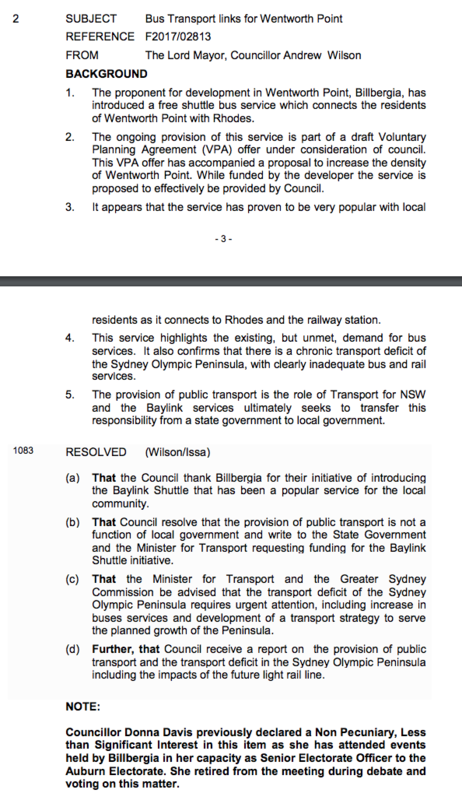 Please support this proposal, the Sydney Buses are full each morning, and with out the new bus service by Bilbergia we are left with no choice but to walk to the train station at Rhodes or drive. The community would also like to know what is happening with the new community centre and library and when it will open. As a local resident I am writing in support of the Bay Link shuttle bus service that is currently operating on a trial for 3 month. I understand that the trial is being run by Billbergia and 2 extra buses, a child care centre, open space and road improvements have been offered, as part of a new development. Many residents support these services and accept that more development will happen. We want Council to support the Bay Link bus service and make it a priority for any more development.